There are four behaviors that I seem to always be dealing with in my classroom. These recurring issues never seem to go away and I seem to deal with them as much on the first day of school as the last. 1. Getting kids to put their names on their work. 2. Walking in a straight line without talking. 3. Getting them to read more. 4. Getting them to write more. In the case of writing, the problem is usually purely motivational. If I ask for a page, I get a paragraph. If I ask for a paragraph, it’s a sentence. When a sentence is an acceptable answer, I end up getting one-word replies. It frustrates me to no end to hand half of the work back incomplete, only to have the same students repeat the behavior, taking the chance that I won’t catch this one. What do these kids read? In my class it tends to be magazines about hunting, trucks and ATVs with lots of glossy pictures, and Diary of a Wimpy Kid. 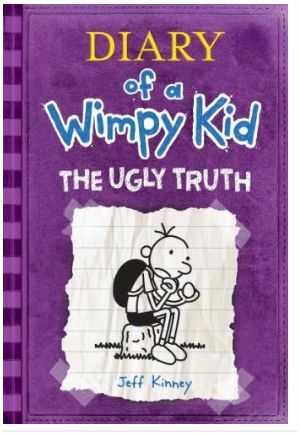 Almost every kid has read the entire series, attracted to its format and its relatable content. And who should be the author behind Weekly Reader’s writing project, Weekly Writer? The ongoing story updated by students collectively adding to it every week is headed by none other than Author Jeff Kinney, the man who managed to get my rabble of cammo-clad charges to sit and read something. Today I saw every single student in my classroom staring stoically into their computer screens, nothing but the sound of their keys clicking away. Thank you Mr. Kinney, Thank you. As I mention frequently, we are a small school, and being a small school means that some people have to wear a lot of hats. My official title is teacher; however, the reality is I teach fifth grade in the morning and technology to fifth and sixth grades in the afternoon. I’m the gifted and talented coordinator for the district and the de-facto technology coach for the staff. Last Thursday I organized and hosted an astronomy night for the community put on by the Elementary Science and Engineering Club. I have never organized something this big. In fact, I had wanted to hold it later in the month, but the weather report was getting ugly fast and the unseasonable warm, clear nights we had been having were numbered. To say it was hectic was an understatement. I had to train several high school volunteers (many completing a community service requirement and with little knowledge of astronomy) on how to use the telescopes. Due to an obligation to an after-school field trip, I actually got to the event location, a baseball diamond, as the sun was going down and people were showing up. The next two hours were a blur. If you asked me how it went at the end of the night, I would have said, “I don’t know.” I spent most of the time running around, keeping the three telescopes lined up on Jupiter and the moon, although the high school kids were a great help in this. 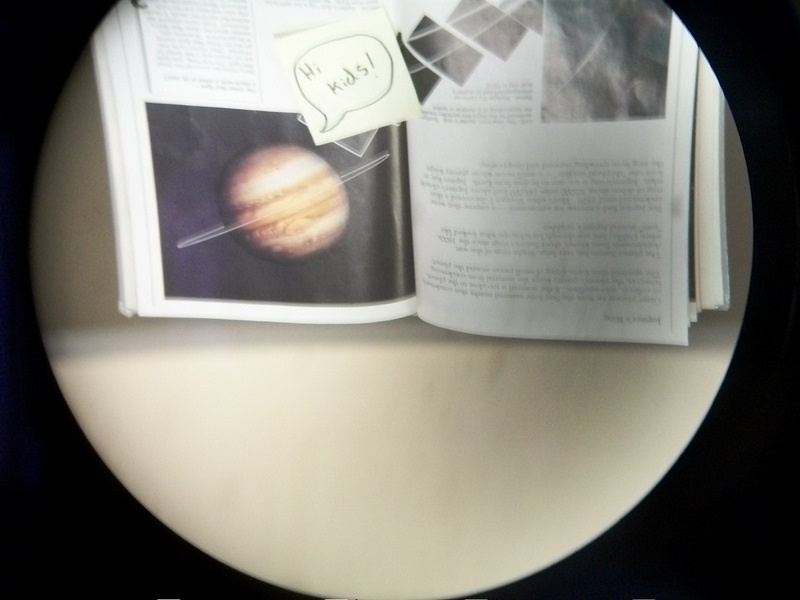 Nothing teaches you that the earth is rotating quite like keeping a tiny point of light in your telescope only to find it racing out of your vision after a few minutes. I don’t know how many people came—I suspect around 40. But I know that I went through more than 50 cups of hot apple cider during the evening. 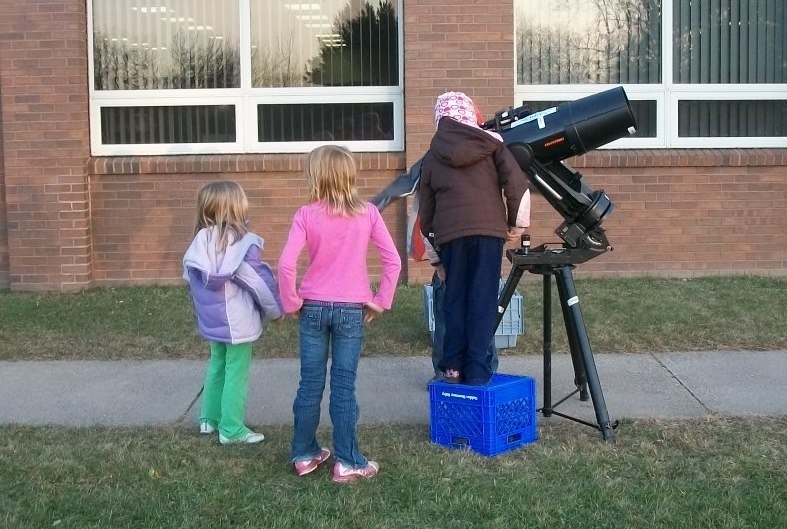 I had three telescopes ranging from a small tabletop telescope costing about $60 to a $2500 one weighing at least a hundred pounds on loan from CESA (our educational cooperative). I had a table set up with Stellarium and a scavenger hunt for constellations. The tragedy of the evening came when I tried to adjust my new telescope and it fell off of the tripod, hitting the ground and cracking the eyepiece off. I was crushed. But a fellow teacher told me that “it did more good being used and broken, than being in a box.” Despite my misgivings and the stress, I know that it went well, because the next day I had the kids who attended fill out a survey in Google Documents that told me as much. Also, the next day I was hounded by kids wanting to know more, telling me that they’d stood out on their decks with binoculars, and that they wanted telescopes for Christmas. I am constantly impressed by the people who I work with. I am not just saying that because I know that a few of them read this and give me a hard time now and then. I work with a third grade teacher who manages a twice weekly after-school program that gives kids social and educational activities. I work with a fourth grade teacher who had her students conduct a biological survey of our outdoor classroom (link to previous story on classroom). The music teacher’s idea of a Christmas concert is a full-on musical starring most of the school complete with costumes and dance numbers. The physical education teacher has kids geocaching with GPS receivers while they learn the basics of snowshoeing. 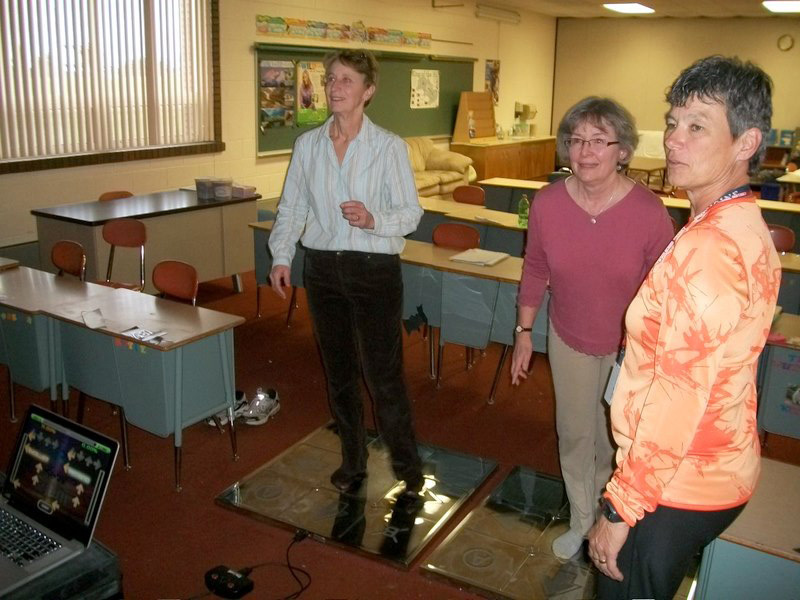 Earlier this week, I came upon this: three of the teachers I work with ‘testing’ a Dance, Dance Revolution set with the SMARTboards. 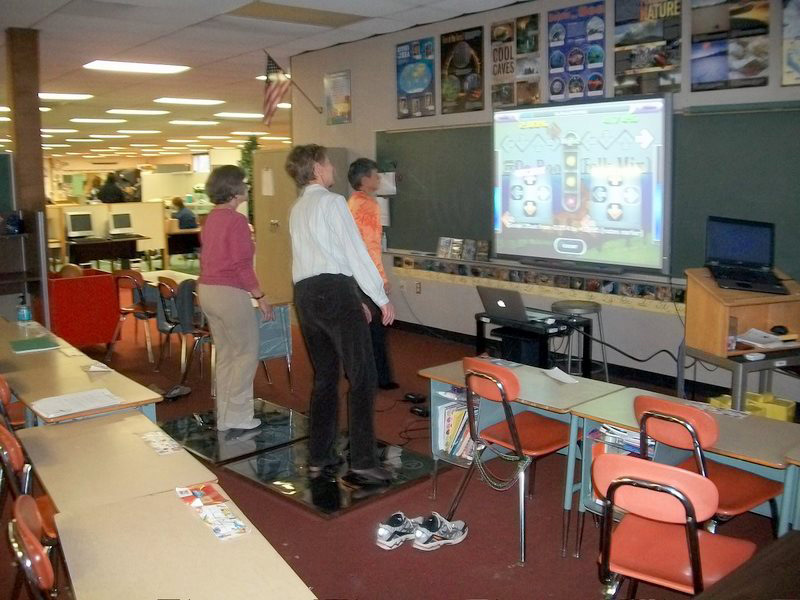 We use the DDR sets during indoor recesses when it’s raining or too cold to go outside, allowing the kids to stay active. I am truly blessed to work with people who put so much fun into their work. Things are going well in Greenwood. Last week we had temperatures in the upper 60’s, something that never happens in November. Usually we would have had our first snow by now, but instead we go out for recess in shirtsleeves. I’m in a rush to finish my astronomy unit for the science club, hoping against hope that we get a clear night. I find myself using Weekly Reader’s online features lately. Having state testing the last few weeks has left us with a lot of time to fill, and rather than filling it up with games or computer time, the other staff and I felt the need to fill it with something meaningful. 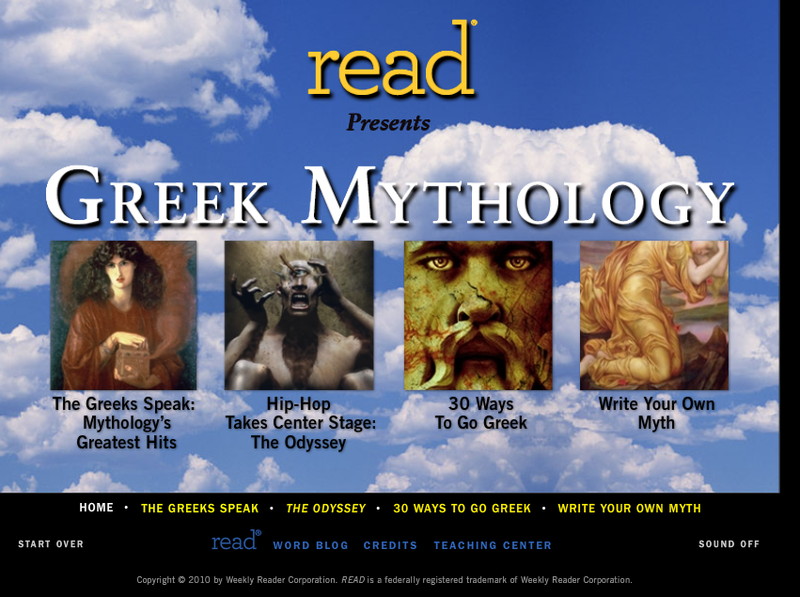 The e-issues have been interesting; the last one on Greek Mythology tied right into the social studies unit that 6th grade had just wrapped up. I think one of the great things that the online e-issues and Weekly Reader do for us is provide a diversity of reading activities so that our kids are not always locked into our reading program. We get a chance to “spice it up” with something interesting, timely and relevant. Blogging is easy for those who bother to give it a try, and for teaching I still think that there is no better way to maintain an online presence and keep kids and parents informed. You can update your website from any computer that has Internet. But it gets better! Several of the blogging options that I mentioned in my last post work with a special suite of software called blog editors. A blog editor allows you to update your blog from within a word processing program. For many of us, this is more familiar and easier to use than a work with than the normal browser interface that many blogging platforms use. You may be using a blog editor right now and not know it! Microsoft Word: Ever since word 07, blogging has been built into Microsoft word. Just go to New>Blog post, and enter your blog’s address and password. You can now take anything written in word and post it with a few clicks to the internet without having to muddle around. Microsoft LiveWriter: Microsoft also made a suite of programs for its Windows Live services. LiveWriter was, in my opinion, the only good thing to come of Windows Live. LiveWriter shows you exactly what the blog would look like in a clean and elegant window; it has a wealth of add-ons that let you manage media and release posts on multiple blogs. Sadly, by being attached to Windows Live, and thus a mass of web apps like Webmail, this great program is locked out from most school web filters. Not that it does a thing wrong, it just has .live attached to its name and that alone freaks network admins out. Zoundry Raven: In a long and mournful search for a replacement for my beloved Windows LiveWriter, I was able to find a suitable alternative. Zoundry Raven is a free, slightly inelegant program that nonetheless works like a champ. I am able to copy and paste ANYTHING into it and get it posted with no problems. I am now able to take a page from my SMARTboard, copy it and past it into Raven, and with a click my assignment notebook or an important lesson is online. Why go through this trouble? It’s all about making the process simpler; it allows entering things into the blog to be easy, with the computer becoming a kiosk that posts things on the web. One of my students now has the job of updating the blog every day with the day’s assignments. With blogging this easy, how can we get kids into it? I was asked at a Gifted and Talented networking meeting last week how to go about setting up a web page. Years ago, setting up a web page meant using a bunch of code or difficult and inelegant web design software. And while this might still be true for some of the die-hard web design people, it has gotten a lot easier for regular folks like us (who have a day job and a life) to set up a web page and update it. Now, I have a personal preference for creating classroom blogs in education. Blogs allow for easy updating of content and their nature of recording posts translates into a sort of online classroom newsletter. They are also very versatile in how they can be used for different applications and allow people to “subscribe” to them if they know a thing or two about RSS—the language of blogs. There are several free options for setting up a blog. Most take about 5 minutes. WordPress is the leader right now in blogging. This is not to be confused with WordPress.org, which distributes the open-source blogging platform used by WordPress. WordPress will set up a blog for you very quickly, usually in a few minutes. Take some time to customize it, and make it your own by adding links, pictures and other information. You’re reading a WordPress blog right now. Edublogs looks and feels like WordPress. In fact, it runs on WordPress. However, unlike WordPress, Edublogs severely limits what you can do unless you pay. Once you pay a small fee, you can set up blogs, video, and other options. Blogger, Google’s answer to blogging, is sleek and well put together. Many features like being able to post a blog via a cell phone or an email are great. However, many schools do not allow access to it, and it does not allow you to make a separate page such as a “school rules” or “Assignments” page.